Since Joseph Kabila's inauguration last December as the first democratically elected president since independence, there has been no improvement on the security front in the eastern provinces. Much to the dismay of the residents of North and South Kivu, who voted massively for Joseph Kabila, he has been unable to deliver on his election promise to bring lasting peace to the region. The security situation in eastern Congo has worsened since the elections and people are calling on the government to do more to stop the militias operating in the region. Last week President Kabila made a surprise visit to the troubled North Kivu province where renewed clashes between government troops and soldiers loyal to renegade general Laurent Nkunda have caused hundred of thousands of people to be displaced. This was his second trip to the region since being elected . He made another surprise visit to the region last December after similar clashes just after the elections. President Kabila promised once again, just as he did on his last trip, to deal with all "negative forces" operating in the region. He warned that he will not tolerate tribal militias in the region under any pretext. Laurent Nkunda claims that his forces are protecting the province's ethnic Tutsi population from attacks by the Rwandan Hutu militiamen, the FDLR (Forces Démocratiques de Libération du Rwanda), who fled into the region after the Rwandan genocide. The government is planning a regional peace conference regrouping leaders from all ethnic groups, militias, elected officials, and the government . This idea has been met with skepticism by the local elected officials who think that only a sustained and intensive military campaign will stop the rebels. The process of demobilization, disarmament and reintegration of former militiamen in the Armed Forces of the Democratic Republic of Congo (FARDC) has shown its limits. These militiamen all too often remain loyal to their former warlords. Nkunda's men had joined the army earlier this year then defected and rejoined him in his latest campaign against the FARDC. Local elected officials have suggested that the root cause of instability in the region is not ethnic strife but rather the interests of a small number of misguided warlords intent on controlling minerals and other resources found in the regions they control. The UN mission in the Congo (MONUC) has been unwilling to engage the militias in a prolonged campaign due to limits on its mandate, or because, like the government, it is pushing for a negotiated solution rather than full scale confrontation. While the government and MONUC continue to call for a political solution , inhabitants of North and South Kivu, who gave more than 90% of their votes tin the presidential elections to Kabila, continues to bear the brunt of the instability. A study by the International Rescue Committee in 2004 demonstrated that nearly 4 million people have died in the Congo since the beginning of the war in 1998. It is estimated that an average of 1,000 people continue to die every day due to the continued instability. 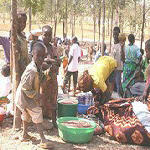 An estimated 600.000 people are displaced in the Congo due to war, most of them are from the East. The latest clashes alone displaced nearly 160.000 people.